The chassis of ADR 813 was new to Plymouth City Transport in 1938, but it received its present Leyland L53R body in 1953. As all I have read about Leyland’s body manufacturing facilities says they finished in 1953, this must, surely, have been one of their last. The chassis is noted in the PSVC listing for 2012 as being a Leyland Titan TD5c, which was probably very useful on Plymouth’s hills! We see it at Winkleigh on 6 October 1996. Leyland ceased body production in December 1954. The last coach body was built for Wilkinson of Sedgefield, the last bus bodies were on a batch of PD2s for Trent. This very bus appears in the (now) very ancient book, "Building Britain’s Buses", in which some school boys are given a guided tour of the Leyland works. Ian Allan published it, but there is no publication date. However it is clear from the photos and text that Leyland’s body building plant was operative at the time of writing this book. The caption to the photo, which shows ADR 813 in the Customer Inspection Department, gives no indication that the bus is a re-body. Midland Red LD8’s are in the background. Because of that caption, it was many years before I understood that this was a re-body rather than an all-new bus. It must have been quite un-nerving to see a PD2 look-alike approaching, only to find pure Leyland TD5 sounds as it pulled away! As even the picture in this view is 20 years old, I do hope that this bus still survives. Thank you, Phil and Michael, for your comments. I can’t speak in respect of recent developments, but this bus was alive and well last time I visited Winkleigh, in 2012. What a wonderful combination, but are we sure that its a TD5c as the normal Autovac is usually replaced by a much deeper device on torque converter chassis. I may well be wrong in always having assumed that this was universally the case. A further thought. I wonder if the radiator shell was not replaced as part of the rebodying contract because Leyland didn’t want a TD5 totally in PD2 clothing. Many operators removed the torque convertors from their Leyland Titans c.1945-47, replacing them with standard Leyland gear boxes for the TD series. If Plymouth did this, perhaps that would account for the replacement of the deeper autovac by a standard size? I don’t have any lists for Plymouth, so this is just a guess. But Southdown and Portsmouth along with others took this option – possibly Leyland put on a "special offer" to cover this change in the early post-war period. In contrast to Pete’s comment about the hill climbing usefulness of the TD5c, I was always under the impression the torque-converter fitted Leylands were very poor on hills. Many operators removed them and fitted a conventional crash gearbox and that could be the case here. The ‘c’ suffix was not always removed from fleet listings when this occurred. I remember riding on the Lytham St Annes Leyland Lion which was still torque-converter fitted at a Heart of the Pennines Rally at Halifax several years ago. The driver insisted on an alternative ‘low level’ route to the mountainous climbs this event always featured as he knew it wouldn’t make it! Chris, presumably by the time of the rebodying the torque converter had been replaced by a conventional transmission. The deeper Autovac was in fact a dual unit containing the hydraulic converter fluid as well as fuel header tank and, after conversion, would have been replaced by a conventional Autovac. I’ve seen a few mentions on this site of the SCT61 website. A look on there shows that, while ADR 813 WAS a TD5C, the rebodying included replacing the gearbox with a conventional one, so I suppose ordinary TD would be the correct caption now. I believe the convention is for the chassis designation to remain as built with a note regarding modifications, for one thing the chassis plate would almost certainly retain the original designation. An example of this would be Halifax’s Daimlers which were fitted with Leyland engines, which remained as CVG6 with Leyland engines and not CVL6, which would be an enthusiasts’ designation as such a model didn’t (to my knowledge anyway) exist. Thanks everyone for clarifying the torque converter query, and for telling me something I certainly didn’t know – that the large tank also included a normal Autovac – I believe the rather intriguing maker’s name of the converters was "Smiths-Lysholm." In the early 1930s Leyland was looking to ease the lot of driving buses in what was then considered heavy traffic. Up until 1932 all its chassis featured a sliding mesh gearbox/friction clutch transmission but Daimler had introduced its preselector system and transport departments were looking to retrain tram drivers as bus drivers so something different was required. A semi automatic torque converter which had been patented by Alf Lysholm under the manufacturing name of Lysholm-Smith was experimented with in 1932. Dr Haworth, Leyland’s Chief Engineer adopted the principle and developed it so that, at the 1934 Commercial Motor Show, the Tiger, Titan, Titanic and Lion chassis were offered with automatic transmission as an option, the first time any production bus chassis had been offered with the option anywhere in the world. The system offered a single lever with direct, converter and reverse drives plus neutral. The vehicles were badged as "Leyland Gearless Bus". The company made its own converters but acknowledged Alf Lysholm’s base patent in its own patents. The gearless chassis sold well and an interesting experiment took place in 1934 when London Transport sent the chassis of STL221, a standard AEC Regent, to Leyland to be fitted with the system. After several days in Lancashire it returned to London, was subsequently bodied and ran with the torque converter until August 1937. The comments from Southall have either been lost to or censored from the annals of history! ADR 813 certainly still exists. It was part of the late Colin Shears’ West of England Transport Collection, so was resident at Winkleigh. ADL is still listed on the collection’s fleet list. The usual open day at Winkleigh in October is taking a rest this year, so it won’t be until October 2017 that we will be able to see this old girl again for real. Phil, your little side-issue concerning LT’s STL221 being fitted with a torque-converter between 1934 and August 1937, as ever, shows LT’s illogicality at times! 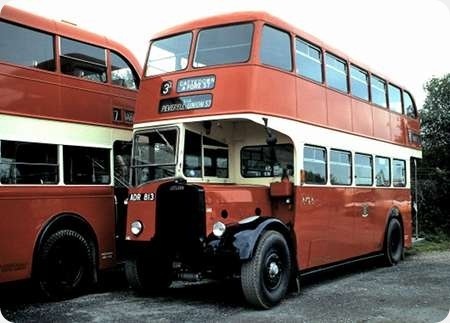 At about the time the decision was being taken to remove STL221’s converter, LT was taking delivery of 100 Leyland TD4’s with Leyland copycat STL bodies, the last 10 of which were fitted with torque-converters! Like STL221, they were soon discarded in favour of crash gearboxes, in 1939, to match the other 90 of the class. To add to this illogicality, if these STD’s were STL clones, why were they not all fitted with pre-selective gearboxes? All very interesting and valid points indeed Chris H.
Turning now to the immediate postwar period, where supply problems were definitely a feature, I’ve no doubt that the sudden arrival of hired in Tilling Group Bristols and the glorious batch of all Leyland PD1s caused much discontent amongst the drivers involved – after all I doubt if many of them were admiring enthusiasts like me !! I absolutely worshipped the STDs for their unexpected individuality in London. A large number where allocated to Victoria Gillingham Street (GM) and they appeared frequently on the long and arduous 137 route from Highgate to Crystal Palace via Streatham. As a youngster, holidaying in the latter, I was a frequent visitor to the free swings and roundabouts in Norwood Park, which involved stopping the PD1 on the steep of Central Hill – even at that tender age I had a conscience about stopping the driver at such an awkward spot. Never in my wildest dreams then did I imagine that I would one day pass my PSV test on an identical glorious PD1 in Leeds. Oh, why can’t we magically turn the clock back ?? Whilst strictly not within the scope of this thread, the mention of Lysholm Smith reminded me that the first Derby Lightweight DMUs of 1954 featured this transmission. To quote from Derby Lightweight DMUs by Evan Green-Hughes, the following may be of interest. "The West Riding sets were made up of two cars, both of which were powered in view of the heavily graded nature of the territory in which they were to work. The well-established Leyland L600 125hp horizontally mounted six cylinder engine, as used in many buses and trucks, was specified and two were fitted to each coach. Riddles had chosen to fit the Leyland Lysholm Smith torque converter transmission which had been used in an earlier LMS three-car experimental unit. This had a double-acting clutch that either connected the engine output to the torque converter pump or directly to the output shaft and was bolted directly to the engine. The clutch was controlled by the driver who could select one of four positions,off, neutral, converter drive and direct drive.Converter drive was used for pulling away or hill climbing, whilst direct drive would be used when going downhill or when travelling along easy graded sections at speed. However, by the time the units were completed, the Lysholm Smith transmission system was already obsolete and the buses for which it was originally designed were being equipped with pre-selector transmission"
Chris, to answer your question re the lack of preselector gearboxes on the STD class, the STL class through its many variations generally had crash gearboxes though a number had Daimler preselector boxes. AEC and Daimler had formed ADC for a short period in the mid/late 1920s and presumably relations were such that AEC could source from Daimler. Leyland was very much its own man and presumably either would not or could not deal with Daimler and a crash box would not have been seen as disadvantageous at the time.